If a Level 5 or higher Zombie monster is on the field: Target 1 monster your opponent controls; take control of it until the End Phase. During your Main Phase, if this card is in your GY: You can shuffle 1 of your banished Zombie monsters into the Deck, and if you do, Set this card, but banish it when it leaves the field. You can only use 1 "Zombie Necronize" effect per turn, and only once that turn. 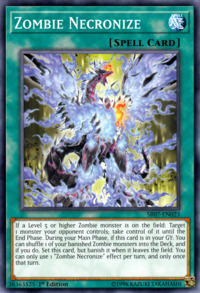 Red-Eyes Zombie Necro Dragon appears on this card artwork.